YANGON — For nearly a decade, Noriko Ogawa relentlessly lobbied for the truth about the death of her brother who was killed by security forces in Yangon. Kenji Nagai, 50, a reporter for Tokyo’s APF News, was in downtown Yangon on Sept. 27, 2007, covering the monk-led Saffron Revolution. He was hit when soldiers opened fire on the crowd. The then military government announced that he was among 11 protesters killed due to “warning shots.” But forensic evidence showed that he was shot at point-blank range. 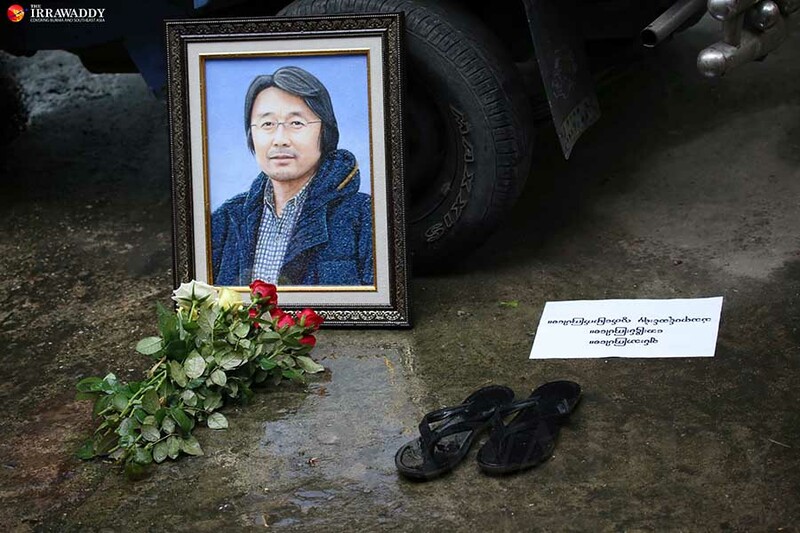 Since then, Mr. Nagai’s family members have demanded the Myanmar government open an official investigation into his killing and return his camera via the Japanese government. His sister Noriko Ogawa has advocated through the media for answers regarding the death of her brother every year. She sent plenty of emails to the Ministry of Foreign Affairs (MOFA) and also took several hours-long trips to the MOFA office in Tokyo from her home in Imabari city in Ehime prefecture. So, on the 10th anniversary of her brother’s death this month, the sister of the slain Japanese video journalist sent a letter directly to Myanmar State Counselor Daw Aung San Suu Kyi to demand acknowledgement from the Myanmar government that her brother’s death was the result of an intended shot and that there would be concrete action taken on the issue. “I expect a sincere reaction [from Daw Aung San Suu Kyi] to my letter,” she told The Irrawaddy. Noriko Ogawa said she sent the letter with “all of her emotion and thoughts she has pondered for 10 years” to the State Counselor because nothing happened when she contacted the Ministry of Foreign Affairs in Japan to transfer her message to the Nobel laureate. “The only thing I want is acknowledgement that my brother’s death was the result of an intended shot. I am eager for your humanitarian decision and concrete action on this issue,” writes the video journalist’s sister in her letter to Myanmar’s State Counselor. “Honestly speaking, I want to take down the militants who brutally shot my brother,” Noriko Ogawa writes in the letter that was viewed by The Irrawaddy. “However, this is not realistic under the current circumstances. What is realistic is to please, please reveal what happened, and acknowledge that my brother was killed. In addition, I want to get back his camera, which he had held tightly in his hands [when he was shot],” the sister wrote. She told The Irrawaddy that the prime minister, deputy minister, minister of foreign affairs, and police chief had tried to convince the Myanmar government to admit the truth in the past. According to an announcement on Japan’s Ministry of Foreign Affairs website, the then Japanese Prime Minister Yoshihiko Noda discussed the investigation and return of Mr. Nagai’s camera with then President U Thein Sein at 2011 Asean-related summit meetings. The statement read that President Thein Sein said the government had been striving for investigation and cooperation with Japan but had not found Nagai’s belongings, adding that he was pained by Mr. Nagai’s death. “About the comment from the former President, Thein Sein, the fundamental recognition about Kenji’s case is completely different from ours. We cannot accept it,” Noriko Ogawa told The Irrawaddy. Kenji Nagai arrived in Yangon on Sept. 25, 2007, when Buddhist monk-led protests against the then military regime were underway. Toru Yamaji, president of the Tokyo APF, remembered that Nagai had been covering a story in Bangkok when the situation in Myanmar escalated. He told RFA in 2007 that he and Nagai had talked about the trip on the telephone, and Nagai had felt the protests in Myanmar would gradually grow to huge proportions and it would be a good opportunity to tell the world about the situation there. “So I gave him permission to go,” he said. Adrees Latif, a Reuters photographer who captured the moment of Nagai’s death on his camera, recalled that soon after the shooting started his eye caught the Japanese photographer flying backwards through the air. Instinctively, he started photographing, capturing four frames of the man on his back. “The entry point of the bullet is clear in the first frame, with a soldier wearing flip-flops standing over the man and pointing a rifle. “More shots rang out. I flinched before getting off two more frames—one of the man pointing the camera at the soldier, and one of his face contorted in pain. Beyond him, the crowd scattered before the advancing soldier,” wrote Adrees Latif, who won a Pulitzer Prize for the picture. Noriko Ogawa recalled that she couldn’t help shuddering and her heart froze when she saw her brother on the TV news upon the notification from the Ministry of Foreign Affairs. In her letter she told Daw Aung San Suu Kyi that despite more and more Japanese corporations making inroads in Myanmar, there has been no progress for the bereaved family, and time has been passing in vain for 10 years now. “My parents died four years ago, without any word from the army,” she said in the letter. “I continue to go every month to the temple where he sleeps. I hope you will not overlook my sincere emotions,” she added. Kyaw Phyo Tha The Irrawaddy Kyaw Phyo Tha is the News Editor of the English edition of The Irrawaddy.